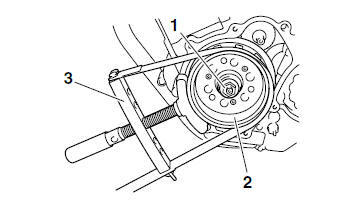 While holding the generator rotor "2" with the sheave holder "3", loosen the generator rotor nut. Do not allow the sheave holder to touch the projection on the generator rotor. To protect the end of the crankshaft, place an appropriate sized socket between the flywheel puller set center bolt and the crankshaft. Make sure the flywheel puller is centered over the generator rotor.